In its first week of release, BTR sold 67,000 copies in the US, landing it at the number three position on the Billboard 200 albums chart. Along with its mainstream success, it also topped the Top Soundtracks, and Kid Albums chart in the US. The album has also managed to gain recognition in Mexico, as well as the Dutch Albums Chart, where it peaked at nine, and Forty-three respectively. The album has received a Platinum certification by the Recording Industry Association of America for sales exceeding 1.500,000 copies. BTR had been in the making since 2009, when the four members signed on for the show, Big Time Rush. The boys worked with composers and producers such as Emanuel Kiriakou, Lucas Secon, Matthew Gerrard, Kevin Rudolf, Edwin "Lil Eddie" Serrano, Jeremy Skaller, Robert Larow, Stuart Grekin, Chris Rojas, Tray J, The Messengers, Eric Sanicola, S*A*M, Sluggo, Timothy Foxx, Jordan Delani. While working on the album, the band released many of the songs as promotional singles onto iTunes, as well as debuted them on their television series. This provided great promotion for the band's music, and led to three hit songs, "Halfway There", "Boyfriend", "Big Night", to begin charting on the Billboard Hot 100. Jordin is an unbelievable singer. If you hear her sing in real life, she sounds just as good live every time. She absolutely deserves to be where she is. She's so talented, and she's a sweetheart too. We're on the same label. She wanted to get into acting, so we wrote an episode about her. She came on and was a great actress. The song is one of our first group ballads. It's a five-way ballad, but it turned out pretty cool. Usually, a duet has one person on each side. This has her voice one side and then there are our four voices on the other [Laughs]. It worked out though. It was such a pleasure to have Jordin on the song. She became a good friend of mine. She took me to the actual show before she was in it last time [Laughs]. She's so down-to-earth like that. On September 1, the album track listing for the standard version was released online. Most of the band's songs featured on the TV Show were included on the album, which also served as the soundtrack to the First Season and part of the Second Season of the series. The songs "Any Kind of Guy", and "Famous", the latter of which is a cover of the Play song, were included on the international release of the album, along with the songs "This Is Our Someday", and "Stuck" (the last one exclusively to the UK and in some iTunes stores around the world). The previously recorded track which featured Jordin Sparks was listed on the album, along with another duet with R&B artist Cymphonique. The second track on the album, "Boyfriend", was originally recorded and released as a solo song; however, upon being released as a single, two new versions of the song leaked onto the internet. The first version featured rapper Snoop Dogg, who appeared in an episode of Big Time Rush with the band. The second leaked version of the song featured the same artist and rapping duo New Boyz. It was initially unknown which of the two would be released as the official single; however, a reworked version which featured Snoop Dogg served as the album's official second single and also a new edit of the song including just New Boyz as collaborating artists was released as a Digital Single on iTunes. Both official versions were later included on the international releases of the album. The music found on the album is mainly pop oriented, as well as R&B. The music found on the album is child-appropriate, as it serves as not only their debut album, but the soundtrack to their self-titled series. Jessica Dawson of Common Sense Media said of the songs on the album, "Not since 'N Sync or the Backstreet Boys has there been a boy band making such a sudden splash in the tweenage music world. Big Time Rush is a standout, not only because of their boyish charm and good looks, but because their music is a cool blend of synth-pop, hip hop, and boy-band harmonies. "City is Ours" is already a digital hit, and "Count On You" with Jordin Sparks is a catchy collaboration about earning your place in a relationship. With a hit TV show to showcase their music and their adorable personalities, Big Time Rush won't be in a hurry out of the spotlight. Parents need to know that this boy band is making tween hearts swoon with their hit Nickelodeon TV show, Big Time Rush. In their debut album they sing about relationships, going out, and making the most of your life, but it's all clean and age-appropriate for young fans." BTR has been met with generally positive reception from critics. In his review of the album, Joey Cage praised BTR, stating "The album features eleven songs mixed from the hit TV show Big Time Rush as well as original music heard exclusively on the album. The album represents the band in an upbeat, pop, rock, and R&B way. From the party sounds of "City Is Ours", "Big Night", and "Oh Yeah" to the upbeat, love songs of “Worldwide” & “Nothing Even Matters”, there’s not a single bad song on the album. I would recommend going on iTunes or to a store a purchasing this CD, these are four extremely talented individuals who deserve your support and they won't disappoint." Matt Collar of Starpulse also praised the album, stating "The self-titled debut album from the Nickelodeon boy band Big Time Rush features many of the dance-pop tunes popularized on the band's TV show of the same name. Showcasing the talents of singers Kendall Schmidt, James Maslow , Carlos Pena, Jr., and Logan Henderson, BTR is a fairly accessible listen that falls somewhere between the soulful alt-rock of OneRepublic and the electro-influenced pop of Katy Perry. These are catchy, sweet, radio and club-friendly tracks that, while aimed at "tweens," should appeal to most any fan of well-crafted dance-pop. To these ends, you get the synth-driven leadoff track "Til I Forget About You," the head-bobbin' "Boyfriend", and the yearning club anthem "Nothing Even Matters", among other highlights." Lineinasong also praised BTR, stating "The album includes hit song "Til I Forget About You" and "City Is Ours" that have been featured on the show before and immediately became hits. It also includes full versions of songs "Halfway There" and "Count On You" featuring former American Idol contestant Jordin Sparks. In the United States, BTR sold 67,000 copies in the first week. It also charted in Mexico, on the Dutch Albums Chart, in Austria, Switzerland, Germany, UK, Greece, Ireland and Scotland charts. The album received a gold and now Platinum certification by the Recording Industry Association of America (RIAA). To promote the album, Big Time Rush embarked on many promotional tours. Member James said of the tour, "Everybody can expect us to be playing 3–5 songs at every high school we're stopping at. Then we're going to be doing a signing. We're in between filming, and that's the crazy part. We're in the middle of the second season. It's going to a pretty fun month for us! I hope people are excited for us to come to their towns. This is going to be done by the end of the month with filming in between, but we absolutely be back on the road with a full set soon." In another attempt to promote the album, the band appeared on The Today Show, where they performed their songs "Til I Forget About You" and "Big Night". The band also performed their latest single, "Boyfriend", at the 2011 Kids' Choice Awards. Rapper Snoop Dogg, who is featured on the single, appeared at the awards show to perform along with the band. Among these performances, the band also performed at the 2010 Macy's Thanksgiving Day Parade. Also, the band recently announced yet another tour. However, this tour will be their first headlining tour, and will begin immediately after filming of the second season of Big Time Rush is over. "Til I Forget About You" was originally released as first single on September 21, 2010 but a week later, on September 29, 2010 the promotional single was finally released as physical CD Single in the U.S., making it the first ever official commercialized single. The tracklist included the Album Version, and the B-side song "Famous". "Boyfriend" was released as second single for digital download as well as mainstream radio on February 15, 2011. The single version features Snoop Dogg. However, the album version is done solely by the band. Another version of the song leaked, which featured vocals from rapping duo New Boyz. "Boyfriend" so far peaked at seventy-two on the Billboard Hot 100, becoming their most successful song to date. "Boyfriend" made it to number thirty on the Billboard Pop Songs chart in April 2011. The third single "Worldwide" was only released over seas as both digital, and physical single. The tracklist included the Album Version, and a remix from the song "Till I Forget About You". Although it didn't debut on the Billboard Hot 100 singles chart in the US, it debuted at number seventeen on the Philippines' MYX International Top 20 on July 23, 2011, and at number eighty-one on the German Top 100 singles chart on August 22, 2011. The first official promotional was their eponymous single, "Big Time Rush" released on December 3, 2009 to promote the airing of the new series. "Big Time Rush" became a minor digital hit, when digital downloads led to its debut at number sixteen on the Bubbling Under Hot 100 singles chart. then. It was retired from iTunes and re-released by April 9, 2010. The second single was "Any Kind of Guy", released on February 2, 2010. The third single, "Halfway There", was released on April 27, 2010. Strong first week sales of the single led to its debut at ninety-three on the Billboard Hot 100 singles chart in the US, where it peaked. This made "Halfway There" the band's first single to chart. "Famous", a cover of the Play song, was released as promotional single on June 29, 2010. The song also appeared on an episode of Big Time Rush. Due to strong digital sales, the single debuted at number nineteen on the Bubbling Under Hot 100 singles chart in the US, making it their second to enter the chart. On August 3, 2010 the band released "City Is Ours". The song became their fourth release to miss out on the Billboard Hot 100, as it failed to chart on any major chart worldwide. "Big Night" wasn't released as single, but peaked 79 on Billboard Hot 100 during the week of the album's release due to over 46,000 downloaded copies sold. The song debuted at seventy-nine on the chart, making it their second highest charting single to date, with "Boyfriend" being their highest (at number seventy-two on the chart). 1 2 Mansfield, Brian (April 13, 2011). "Adele re-takes top album spot; Jennifer Hudson drops from Top 10". USA Today. 1 2 "Bridgit Mendler signs with Hollywood Records, Big Time Rush certified Gold, Will Joe Jonas open for Britney Spears, Pics from Savannah Outen and Josh Golden's music video, Destinee and Paris sing The Big Bang, Disney to make song for Japan, Kids' Choice Awards flashback, Tron: Legacy Reconfigured, Zendaya appearance at World of Wheels". Tommy2.net. 2011-04-01. Retrieved 2011-12-16. ↑ "Big Time Rush Talks "BTR", Upcoming Tour and Tarantino – ARTISTdirect News". Artistdirect.com. Retrieved 2011-12-16. ↑ This review was written by Jessica Dawson (2010-10-12). 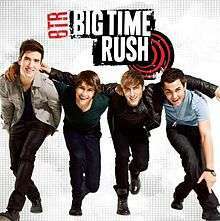 "BTR – Music Review". Commonsensemedia.org. Retrieved 2011-12-16. ↑ "TV/Movie Reviews – Joe's Universe". Joeycage.webs.com. Retrieved 2011-12-16. ↑ "Big Time Rush Album Review, Songs, Ratings". Starpulse.com. Retrieved 2011-12-16. ↑ "USA Today". June 15, 2011. ↑ "Big Time Rush Performance – 2011 Kids' Choice Awards The Show". Fanlala.com. 2011-04-04. Retrieved 2011-12-16. ↑ "Big Time Rush To Perform At The Kids Choice Awards!". hollywoodteenzine.com. Retrieved 2011-12-16. ↑ "Ministry of Gossip". Los Angeles Times. 2011-04-02. ↑ "Big Time Rush – Til I Forget About You (CD) at Discogs". Discogs.com. Retrieved 2011-12-16. ↑ "Til I Forget About You: Big Time Rush: Music". Amazon.com. 2009-09-09. Retrieved 2011-12-16. ↑ FMQB.com Retrieved on 2011-02-04. ↑ Scholastic. "Worldwide (2-Track): Big Time Rush: Music". Amazon.com. Retrieved 2011-12-16. ↑ "City Is Ours – Big Time Rush". Billboard.com. Retrieved 2011-12-16. 1 2 3 4 5 6 7 "BIG TIME RUSH – BTR (ALBUM)". Big Time Rush – BTR (Album). Asociación Mexicana de Productores de Fonogramas y Videogramas. Retrieved 30 March 2011. ↑ "BTR Big Time Rush". itunes.apple.com. 2011-04-15. Retrieved 2011-04-29. ↑ "'BTR' UK fan edition tracklisting revealed! | The Official Big Time Rush Site". Btrband.com. Retrieved 2011-12-16. ↑ "Scottish Albums Top 40 – 17th December 2011". Official Charts. Retrieved 2011-12-16. ↑ Caulfield, Keith. "Lil Wayne's 'Human Being' Leaps 16‒1 on Billboard 200", Billboard.com, Published on 2010-10-08. Retrieved on 2011-02-04. ↑ Search Results, Billboard.com. Retrieved on 2011-02-04. ↑ "Los Mas Vendidos 2011" (PDF). Retrieved 2012-05-12. ↑ "The Best of 2011: The Year in Music". Billboard.com. 2011-12-09. Retrieved 2012-05-12. ↑ "Los Mas Vendidos 2012" (PDF). Retrieved 2012-01-25.